Where am I, and what is happening? Here are some nitty gritty nuts and bolts of what is happening to me, in case you’re interested or about to undergo this procedure yourself. On Monday, we arrived at Midway Airport and took the train to our Residence Inn. You take the Orange Line to Clark and Lake, and you get off the train and either take a cab or walk 10 blocks to the hotel. We usually walk, but this time, our bags were ridiculously gigantic. Northwestern has a deal with the Residence Inn on the Magnificent Mile, so we get a 2-room suite with a kitchen (750 square–foot). I feel swanky danky. The windows open, the bed is big, the day is pleasant. We get to the hotel at around 3:00. Chris will be staying the hotel the whole time, but am only there for two nights. I want to do a little writing (I’m working on something), and Chris wants to take a nap and go exercise, and it’s abundantly pleasant. We go to dinner at a Chicago deep-dish pizza place and have a terrific time. We went to Giordanaos this time. Last time we went to Lou Malnati’s. Chris prefers Lou’s. I like Giordanaos. Definitely worth getting. I have a 7:00 am appointment to get two central lines placed. One in my arm and one in my jugular. Both lines go to my heart. The room we do it in has lots of imposing white machinery, a table for me, and x-ray things that they can use to see inside me. It is very cold. I get on the table and they clean my arm and my neck and get everything prepped. Here are some of the words the doc used. You will feel a pinch, some stinging, then a lot of burning. This is the local anesthetic going in. The burning makes my fist clench. I say yes. They do some other things, make an incision, and thread a needle in to guide them. I can see the needle on the little monitor, but my face is turned away from them. Some hard pushing. We’ll do it three breaths. Hold your breath on each push and it will make it go easier. He pushes hard on the line and forces it through my vein. I cringe. I know it hurts. You’re doing good. The anesthesia has run out on your neck. I just need to do three quick stitches. No anesthesia. Okay? He pats my hand. Yes. A tear escapes as I feel him sewing on my neck. More from the ick of it than the actual pain. Okay. All done with that. Now to the picc line. Halfway there. They add a picc line to my arm. It is a line into my bicep, and it has 3 tubes coming out of it. Something is pinching and hurting in my arm. But I let it go. 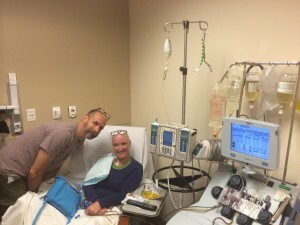 It’s time for plasmapheresis, which is a protocol specific to Devic’s patients. Apparently we create antibodies that attack the immune system (and I have been suspicious of the gluten and dairy antibodies for a while now.) The idea is this: dump all the antibodies, dump the disease. My appointment was at 9:00, but we don’t get there until 9:30. They use the port in my neck and hook it to something that is a lot like a dialysis machine. One of the lines takes my blood to the machine, the plasma is separated out by centrifuge, and synthetic plasma is added before the tube returns the blood to my body. Neck port and machine to remove plasma. I secretly hope that this new synthetic plasma will come with super-powers. What superpower should I get with all new plasma? The ability to make people feel all gloppy? I think I have that power already. The nurse holds up my bag full of plasma. It looks like five gallons to me, but Chris says it was more like a gallon. It’s orangey-yellow, like the heirloom spaghetti sauce I made this summer. She says: Say goodbye to your disease. And drops the bag in the red biohazard bin. To my mind, I have just taken one of many steps on this path. I don’t even say goodbye. I wave like a queen. The nurse suggests I take a hydrocodone for what’s next. She about to remove the port from my neck, and the antiseptic she uses to clean the wound will sting, then when she pulls the catheter through my vein, she’ll do it in one quick motion, and there will be some discomfort. Then it will be tender for few days. When a nurse says, I’m about to do something to you, but you should take a hydrocodone first, take it. The nurse was right on all counts, although I would have used stronger words, maybe curse words to describe it. I wish I’d taken a hydrocodone ahead of the insertion, taking the edge off would have been nice. Then Chris and I are released into the wild. I wanted to write a blog post (about honey badgers and empathy weasels), and Chis wanted to exercise and nap again, so we did that until it was time to get ready to go to a fancy dinner. I have a lot to hide now – a port in my arm, a giant bandage on my neck, a bald head. And, as I have already established, I am vain. I want to look beautiful for Chris. I manage it: leather hat, scarf around my neck, long sleeved shirt. My left port is still hurting, so I keep it straight and eat with my left had though dinner. Everything was delicious and unique. We went to Nico Osteria, and we had the best meal we’d had in Chicago yet. When I get to the hotel, my picc line is really hurting. I take my long-sleeved shirt off and discover that it is bleeding. My mom, sister and Atul are supposed to do distance Reiki on me now (I will explain in a future post). But I can’t empty my head. All I can imagine is taking a sleeping pill and a Xanax, going to sleep, and quietly filling the bed with blood. I ask Chris to see if he can find out if we should go to the emergency room. Chris pages Dr. Burt, who calls him right back and says the emergency room won’t know what to do with it. They’ll dink around with it for four hours then it’ll be time to be admitted anyway. He recommends we apply pressure. Pressure hurts, but after I am finished with Reiki, Chris wraps it and presses it very lightly. As long as I don’t move, it doesn’t bleed. I drink more wine. It’s the last wine I’ll have for at least a couple of weeks. We watch Stephen Colbert in our king-sized bed. (When Chris and I were first dating, I was 21 and he was 29, and we used to watch Letterman in his bed. He was a smoker then, and I would smoke sometimes too, and we’d just ash behind the bedframe. That was also where we put all our used tissues. One time, it caught fire, but we managed to put it out.We were dirty birds and well suited to each other. We’re still together, married 18 years. We’re still slobs, although we work very hard not to be.) Anyway, watching the late show with Chris reminds me of the college days and how much I still love him. He’s a good egg. I take a sleeping pill so I can sleep, I do not fill the bed with blood, and I show up at Prentice Pavilion at 7:30 am for admittance. I’m anxious, but not too anxious. I just need to keep taking steps in the right direction. Day minus-4 to day minus-1 (9-11 to 9-14) will be exactly the same as today. (They will leave me hooked to fluids through the port and leave the catheter in.) 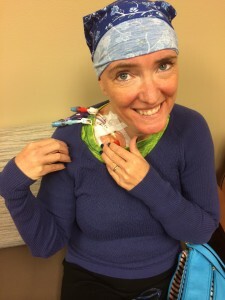 I am told that I will feel progressively worse as the chemo builds up in my system. Twenty-four hours after my last round of chemo, they will remove the catheter (Hooray! 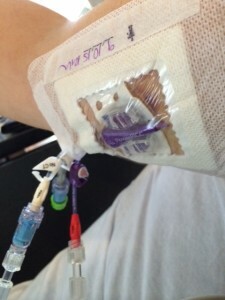 ), but not the picc line. Day 0 (Sept 15) They will give me my stem cells back through the picc line. Ironically, I’m supposed to feel the worst on this day. I think I will need crème brulee to celebrate. Day 1 (Sept 16) More Rituxan to be sure all the B cells are gone. This is also supposed to be a bad day as the chemo will still be raging. Sept 16 – Sept 23, 24, or 25 Nothing will be attached. I will get progressively better. We will wait and watch my cells grow, especially my white blood cells. I will be free to roam the hall (wearing gloves and a gown) until they release me to home, which I hope will be Sept 23. Some E.vil girls are coming to visit, and I hope to stir up some trouble. Then I will be home. And as I get better, all my MS might go away. It could take years, but without the constant attacks from my immune system, my body might be able to rebuild the myelin sheath around my nerves. I daydream about running, jumping on the trampoline, dancing like a maniac for hours. (And the poop and pee — I’ll be the boss again.) The best will be not to have the constant worry: I wonder if I can make it? MS has been with me everywhere I go. It will be nice to put that down. I promise I have some funny blogs in the works. Catheters make humor less funny.